New Restaurant in Pittsburgh Brings Spice, Sauce and a Great Cause. BBQ is making its way to Pittsburgh in new ways, Mission BBQ brings BBQ to a fast-casual experienced with feel-good values behind the brand. Mission BBQ has core values that support heroes in our communities. Heroes like the men and women who serve as soldiers, firefighters, police officers, first responders and others who risk day after day to defend the country and help those in need. Mission BBQ also sells a large reusable cup and $2.00 from every one sold is donated to local nonprofit. As an additional way to show support, Mission BBQ lists National Organizations on their website for donation or volunteer information. The Walls of Mission BBQ Proudly Thank Service Members. Mission BBQ also hires veterans. 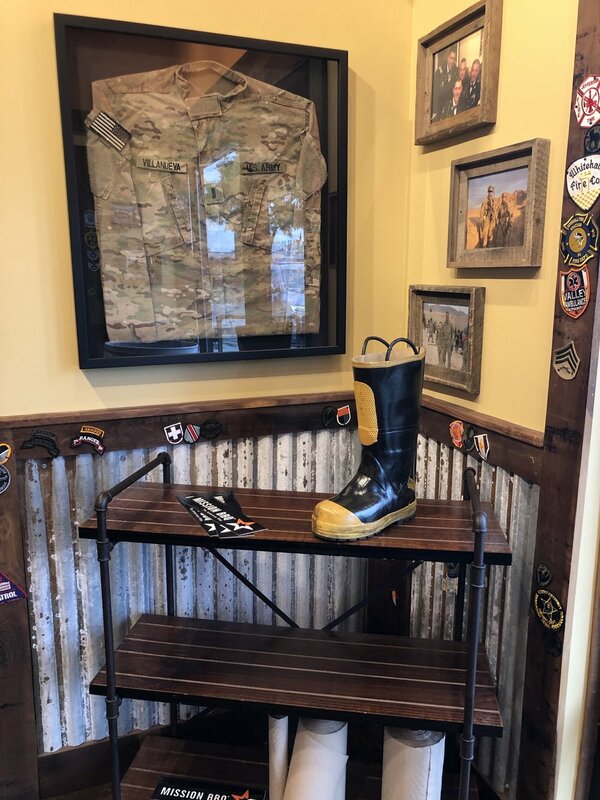 Mission BBQ encourages a place where every hero is highlighted from the photos on the walls of veterans, soldiers and service members. USA is important to Mission BBQ and it’s staff and it shows every day when team members salute and stand at attention for the National Anthem at noon every day. The food at Mission BBQ is awesome. All food is made in house and fresh every day. It is fast casual, you order as you enter and they call your name when the dish is complete. There is a soda bar to pour your own soda and the sugars, lids, and condiments live in a Craftsman Tool Box (this was really fun). We tasted two sandwiches and three sides. The brisket sandwich can be ordered moist or dry and sliced to order. Next, we tried Turkey. It was wholesome and light. Both sandwiches come without anything on them. On each table, there are six sauces to choose from. For sides there are two options: XL Combo adds one side and a drink or the XXL Combo adds two sides and a drink. Today we tried French Fires, Cheesy Potatoes, and Maggie’s Mac-n-Cheese. All of the dishes were exceptional. Nothing was greasy and the fries were crispy (the best part of French fries). Favorite Sauce was the Memphis Belle, a “sweet” and “smokey” sauce. Mission BBQ has one location in Pittsburgh, however, there are locations in sixteen states. Locally Mission BBQ is at 6541 Steubenville Pike, just outside of Robinson area shops. Orders can be ordered to go and catering is available. For more information visit https://mission-bbq.com. Cheers! Have a restaurant or brewery you would love us to check out? Send us an email or comment below. Pittsburgh has become such a foodie city. Visit our piece on V&V Scratch Kitchen, Coughlin’s Law and Choolah Indian BBQ.